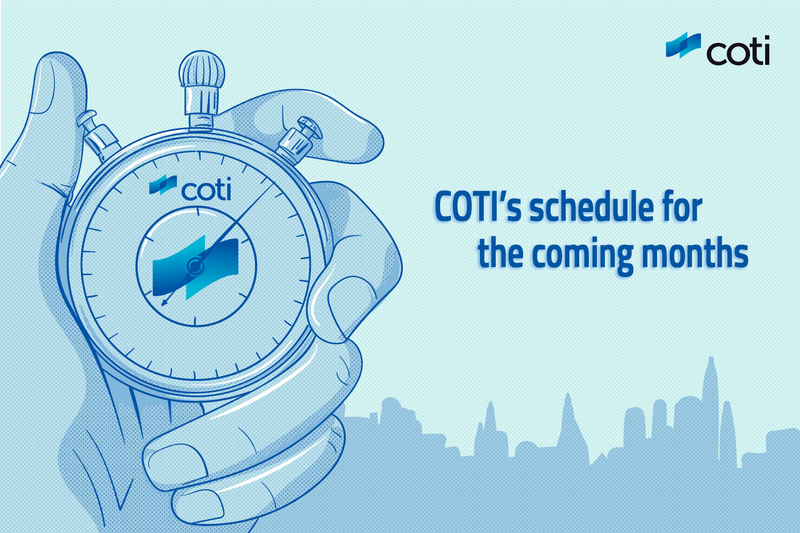 Announcing COTI’s schedule for the coming months: MainNet launch, TGE, IEO and more. What happens in Private MainNet? What happens in Public MainNet? When will I receive my COTI wallet? When will I receive my COTI coins? When will COTI finalise the raise? When will COTI list on an exchange? The COTI team has been making great progress in bringing our project towards our promised MainNet release. From a simple payment dApp built on Ethereum in late 2017, to a fully fledged DAG based blockchain ecosystem in 2019, we are now closer than ever in delivering the technology we believe will be the first killer app for the blockchain, designed specifically for payments, backed by stable coins and focusing directly on the masses. For those who aren’t aware of the history of the COTI project, please see our most recent update article COTI: The Path to Adoption in which we detail our approach, implementation and philosophy in creating what we consider to be “Blockchain 3.0”. Before going into the specific details of our MainNet, we’d like to invite you to take a look back on the more intimate details of our TestNet and our progress and achievements during this period. COTI moved from Proof of Concept stage, in which we built our COTI Pay dApp on ETH, to the alpha version of our TestNet in September of 2018. Alpha TestNet was the very first implementation of our Trustchain DAG based infrastructure as detailed in our technical whitepaper and included setting up the base level infrastructure to support our DAG and the various features it includes, the COTI Pay dApp, the COTI-X exchange and our financial node infrastructure (Trust Score, KYC, DSP and Full Nodes)..
On TestNet we performed months of simulations that included testing scaling and transactionary volumes, running with closed garden fixed nodes. In these tests we were able to demonstrate a TPS of 7K — 10K on TestNet. As DAG technology scales upwards based off the number of nodes and volume of transactions on the network, we are now confident the network will reach our intended baseline target of 100K+ TPS with the addition of full nodes and increased transactionary volume on public MainNet, once additional merchants, users and nodes are on boarded. TestNet also included onboarding our first round of enterprise clients in Netcore and Swiftency. Both companies facilitate next generation payments to their merchants user base and have built a solution on top of our infrastructure. Between these two clients, COTI has processed a combined $3M USD in transactions in less than two months, generating both success for our clients, early revenue for COTI and faith in the underlying COTI network. As COTI coins have not yet been created, these clients used BTC as a base currency for transacting on the network while in TestNet. Past these two enterprise clients, COTI also signed an agreement with Ormeus to develop the first version of a whitelabeled client solution. This agreement enables Ormeus to utilise COTI’s DAG (as a parallel DAG, specific to Ormeus) to issue their own coin, to use COTI’s merchant payment tools, as well as a bespoke implementation of our COTI Pay app that runs on Ormesus physical Point Of Sale (POS) terminals. This deal brought in $1.5m USD as a one off “cash” payment to COTI and future profit share of transactions process on the Ormeus network, an incredible achievement considering we have still not yet finalised our tech build, rollout and fundraise. This type of arrangement is indicative of future enterprise partnership agreements COTI will be signing, allowing for enterprise to issue their own coin on top of the COTI network with the full support of COTI. In recent months we have also signed agreements with several major enterprises, like Blue Cellular in Africa, Millenning in Singapore, REMIIT in Korea, and as such, expect to rapidly grow our numbers of users, merchants, usage and revenue as we onboard these clients and progress towards our Public MainNet. After a successful Alpha TestNet release, COTI moved into the beta version of our TestNet in December of 2018, adding greater scale and additional features to our initial TestNet release. With these successful developments, we are now confident and ready to release our MainNet, as planned and as scheduled. Private MainNet will be the first implementation of the COTI network that will be used by the masses. Unlike traditional blockchains, which begin with the create of a genesis block, the creation of a DAG begins with a genesis transaction, in which the COTI coin supply is created and assigned out to various wallets. As such, in the first week of April, we will have our genesis transaction event, which will involve the creation of the COTI coin, along with distribution of said coins to our liquidity pool and incentivisation pools. We will also move COTI coins earmarked for distribution to users participating in our private and public sales to a separate wallet. Again, a notable difference between a traditional blockchain and a DAG is in the way in which transactions are validated. Unlike PoW or PoS networks in which the algorithm is a central point to consensus and defines the truth about the network topology, a DAG based infrastructure uses two previous transactions to validate a live transaction. As such, there is a minimum level of transactionary volume required on a DAG before transaction can be validated in a timely manner. It is for this reason we have taken the approach of a Private/Public MainNet launch, ensuring that these requirements will be met and the network will function correctly before a full public release. The creation of the COTI coin will allow for additional enterprise clients to be on boarded onto the network and for these clients to transact on the network in more of a “real world” scenario, as compared to TestNet. Unlike TestNet, in which BTC was used to facilitate fees on the network, the use of COTI coins will mark the first use case of COTI being used as a means for transactionary fees. From this point on, all users, from general, to merchant, to enterprise, to those who issue their own coin on top of COTI, will use the COTI coin as a method of processing transactionary fees on the network. While Private MainNet will be closed for public access, COTI will release our block explorer as part of the Private MainNet release. This will give all members of the public a transparent view as to the inner workings and progress of the COTI Private MainNet. The public MainNet is the first official release of the COTI network proper. The MainNet specs include the vision outlined in our whitepaper, as well as a solid foundation to nurture our sprouting fintech ecosystem. This is quite exciting, as it’s the first blockchain infrastructure that easily enables the creation of fintech products on a mass consumer scale. Some of the key technological innovations include an arbitration system that safeguards buyers and sellers from errors, fraud and counterparty abuse, as well as an enhanced privacy layer to protect transactions in a way which has not yet been possible for blockchains. DSP consensus adds an extra layer of security, solving the fundamental problem of double spending for all high performance distributed ledgers. Other advancements include one-click payment requests, which enables any merchant to easily integrate PayPal-like payment buttons on their website for instant checkouts. Trust scores resolve the lack of trust faced by most blockchains, while node managers introduce an automated way of discovering neighboring nodes and avoiding the potential risks associated with accepting data from other nodes. The main difference between our Private MainNet and Public MainNet is that arbitrators and full node operators can register from day one, and as such marks the first time the general public can interact with the network. As we onboard the first full node operators, some will become DSP and Trust Score nodes later on, as the network scales to include these participants. We will begin issuing wallets with the launch of Private MainNet. Since TestNet wallets (which many of our users already have) are incompatible with MainNet wallets, we need to issue over 85K + MainNet wallets to our users and onboard our 5K + registered merchants. Obviously this will take some time, and this process will begin in the second week of April, with the wallet distribution phase to be finalised before the release of Public MainNet. Full details of the MainNet wallet creation process and registration will be released in a separate post, along with a video tutorial, in the second week of April. Once our users have set up their MainNet wallets, COTI will begin the distribution of COTI coins to users who have purchased coins as part of our raise or have participated in our bounty program. This will coincide with Public MainNet release, as we want to ensure MainNet is functioning as it should, prior to the release of any coins to the general public or merchants. It is important to note that despite users holding coins in their wallets as of the public MainNet, COTI coins will not be available for trading on a secondary marketplace until our fundraising is complete and the COTI coin is listed on an exchange. With regards to COTI coin holders, we have decided to grant additional bonus coins to contributors that purchased coins before 1.1.2019. They will be granted a 1% bonus for each month from this date until tokens are distributed. For example, if you purchased 100 coins prior to 1.1.2019 and the TGE will be taking place on 1.6.2019, then you will earn a bonus of 5% (5 months * 1% bonus). In learning from the mistakes of other ICO’s, we have been very conservative in managing our treasury and burn rate, ensuring our project has a long runway. As we’d like accelerate our growth rate and start opening offices globally, ensuring more users, merchants and enterprise clients can join our network based off an aggressive go to market and business development strategy, and as requested by our community, we have decided to raise a last tranche of funds prior to our public MainNet release. Tokens sold at that stage will be sold at a higher price than in previous tranches as to not disadvantage early supporters. We have taken a two fold approach to finalising our raise. Firstly, by selling equity + bonus tokens via a crowd sourced equity funding platform, and secondly by running a more traditional token sale. For the pure token sale, we are currently in talks with several exchanges in regards to hosting an IEO that we expect will take place in June. As expected, we obviously cannot go into too much detail on this point, as we’re currently in talks with several tier one and two exchanges in regards to both an IEO and token listing. However, we expect a listing of the COTI coin on an exchange around July 2019. An important point to note here is that unlike some other ICO’s, COTI will list with a fully functioning MainNet with active users, merchants and enterprise clients on day one. Third week of April: Private MainNet release (expected to run for 8–10 weeks after which we will launch the public MainNet). In addition, we will be releasing the COTI ledger explorer. At this stage, users can begin registering for COTI wallets (to be finalized before the public MainNet). Coin distribution: will take place once wallet distribution is complete and the MainNet is publicly opened. Additional updates will be released soon. For now, on behalf of myself and the entire team at COTI, we’d like to thank you for your continued support! In the decentralized economy of the future, there will be a need for decentralized payment platforms - Our vision is to allow users to exchange value as easily and as freely as it is to exchange information over the internet.